PALMDALE, Calif., April 19 /PRNewswire-FirstCall/ -- The second Boeing (NYSE: BA) 747-8 Freighter, RC521, landed in Palmdale, Calif., today, marking the beginning of a planned transition of 747-8 Freighter testing to Southern California. The more than four-hour flight from Boeing Field in Seattle included testing on avionics and cruise performance. "Taking the airplane to Palmdale is a big step," said Mo Yahyavi, vice president and general manager of the 747 program. "The team is focused on ensuring a seamless transition into the next phase of the flight-test program as we prepare to expand testing of the 747-8 Freighter's performance characteristics." The airplane will be stationed in Palmdale for the majority of its scheduled flight-test program. The crew will conduct several tests on the airplane with fuel-mileage and engine-performance testing as key focus areas. 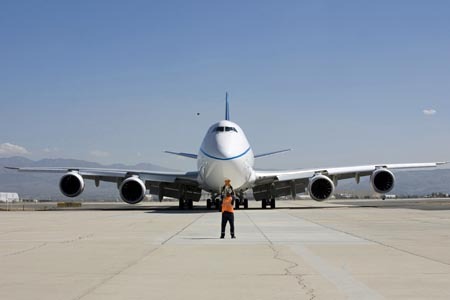 "Palmdale provides an excellent test environment for the 747-8 Freighter," said Andy Hammer, 747 test program manager. "It allows us to take full advantage of one of the world's premier experimental test flight facilities and the excellent weather conditions to meet our flight-test requirements on the road to obtaining our amended type certification." A contingent of employees has been stationed at Palmdale for the testing, including flight-test engineers and the support personnel who prepare the airplane for each day's flights. In the coming weeks, the two other 747-8 airplanes in the flight-test fleet will join RC521 in Southern California. The entire flight-test program calls for the three airplanes to perform a total of about 3,700 hours of ground and air testing. The first 747-8 Freighter delivery to Cargolux is planned for the fourth quarter of this year.